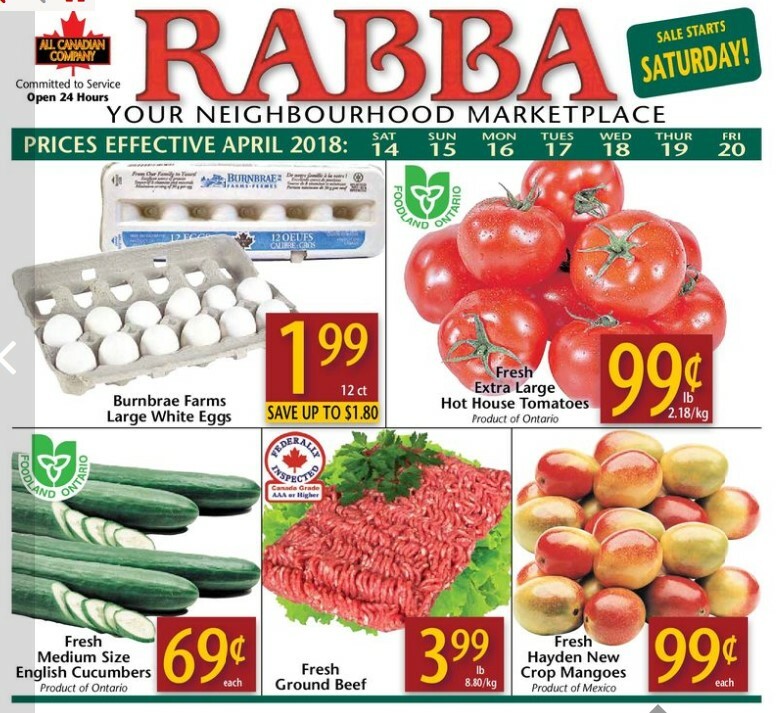 Rabba Fine Foods Flyer April 14 - 20, 2018 is currently available – Find the latest weekly flyer for Rabba Fine Foods. Also, keep your challenge with coupons and great deals from Rabba Fine Foods. Rabba Fine Foods is Since our humble beginnings about forty years ago, Rabba Fine Foods has had a proud history of bringing high-quality food to our customers with a friendly personal touch. With simple but unshakable mentality, we can expand our selection and service to more than 30 locations in the GTA. Even with the expansion of our business, we always pride themselves with the ability to fully maintain interaction and ease the same personal desired by each customer from their local neighborhood market in a European-style store a small, friendly. 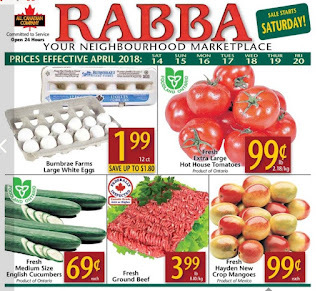 Low price in every day for people who visit Rabba Fine Foods, and there are a special great deal in Rabba Fine Foods product. General mills cereal cookie crisp 318 g, nesquik 370 g, cinnamon toast 360 g, lucky charms 330 g, golden grahams 340 g, french toast crunch 380 g. Cheerios: chocolate 350 g, regular 400 g, honey nut hearty oat crunch 430 g, honey nut 460 g, multi grain 390 g. - Sale Price $2.99 Savings $3.00. Fresh Strawberries - Sale Price $1.99 1 lb clamshell. Product of USA. Dempster's Bread Regular Price $2.49Sale Price 2/$4.00 675 g. White, 100% wheat, grainhouse soft slice thick white or whole wheat. Fresh Large Hot House Tomatoes Sale Price $0.99/lb $2.18/kg. Product of Ontario. Maple Leaf Natural Selections Lunchmeat Sale Price $3.99/175 g Savings $3.00 Assorted varieties. Breakfast including : Melitta Coffee $4.99 Sale Price $2.50 Savings Assorted varieties. 250 - 300 g, Black Diamond Cheese $3.99/270 g Sale Price $1.70 Savings Assorted varieties. Dempster's Bagels $2.79/6 ct Sale Price $1.20 Savings Assorted varieties, etc. Dinner product on sale such as : Prego Sauce $2.99/645 ml - On Price $0.80 Savings Assorted varieties. DeCecco Pasta $2.19/500 g - On Price $0.80 Savings Assorted varieties. Furlani Texas Toast $2.99/638 g - On Price $1.50 Savings Garlic or parmesan. Old El Paso Burrito Or Hard Taco Dinner Kits $3.99 - On Price Up to $2.00 Savings 250 - 510 g. Old El Paso Regular Tortilla Bowl, Sliced Jalapenos Or Medium Taco Sauce $2.99 - On Price Up to $2.00 Savings Old el paso regular tortilla bowl 189 g, sliced jalapenos 250 ml. Medium taco sauce 215 ml. Halloween Specials including Fruit By The Foot, Fruit Roll-Ups Or Dunkaroos $2.99 Regular Price 2/$5.00 - On Price Assorted varieties. 128 - 141 g. Dare Real Jubes $3.99/385 g - On Price $1.00 Savings Assorted varieties. General Mills Bugles $1.99 - On Price $1.30 Savings Assorted varieties. 212 - 213 g. Orville Redenbacher's Ready To Eat Popcorn $2.99 - On Price $1.00 Savings Assorted varieties. 150 - 220 g. Yucatan Guacamole $3.99/227 g - On Price $1.00 Savings Assorted varieties. Old Dutch Or Double Dutch Ridgies Chips $3.99 Regular Price 2/$7.00 - On Price Assorted varieties. 235 - 255 g.
Visit yout nearest Rabba Fine Foods store or navigate on their website and get your Rabba Fine Foods Coupons at this moment in time. 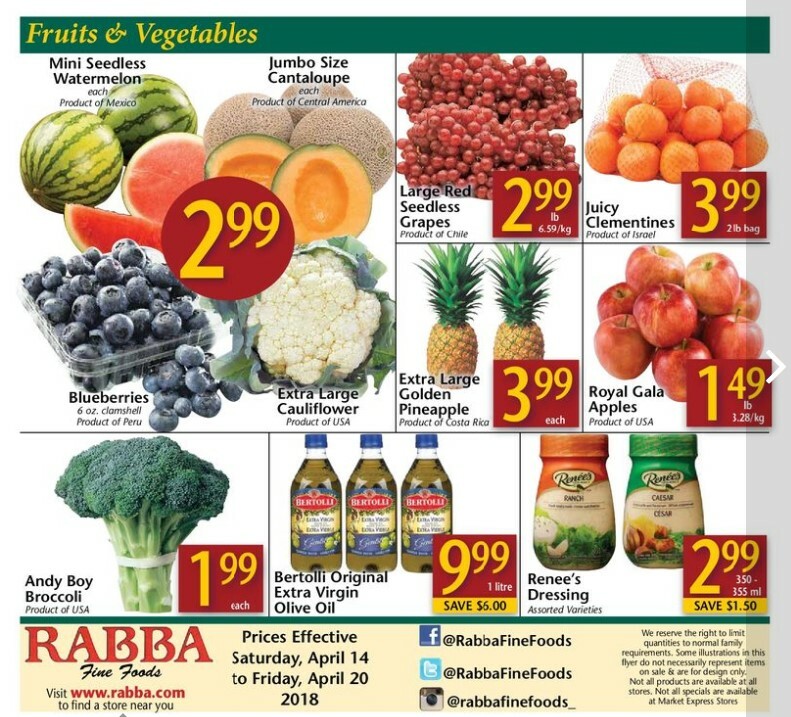 With this flyer, you are sure to prove that in Rabba Fine Foods. 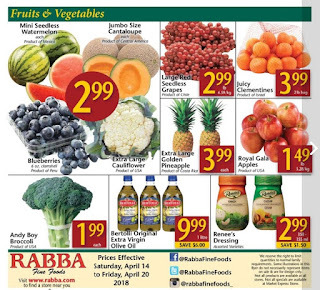 For more details, you can visit the official website Rabba Fine Foods website here. You need to enter a zip code or state to see for more information Rabba Fine Foods. Thank you for visiting this site.